Squirrel! Romney packs Red Rocks; libs want to talk … New Deal? My wife and daughter tried to go to Romney rally at Red Rocks and were turned away. Packed house sellout. Couldn't get close to event. So sad. Waited 2 hours in line and did NOT get into Red Rocks to see our future President Romney. Thousands turned away!!!! Drove 500+ miles to Romney rally at Red Rocks. Didn't get in. Don't mind (much). Crowd huge. 1000s couldn't get in. This is a good thing. Enthusiasm? You could say that. @dmitchell624 Shorter Mainstream Media: Bump is gone, Hundreds show up for Romney/Ryan. Media fools. GO COLORADO!!!!!!! Amazing event in Colorado, Red Rocks. People holding signs "Democrats for Romney" At least 9,000 attended. Justin Romney or Mitt Beiber? 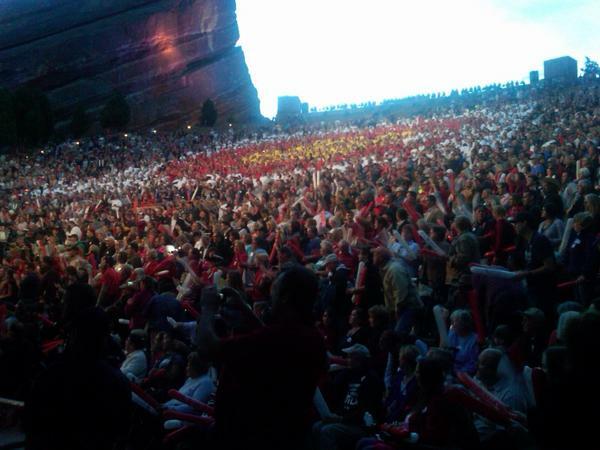 MT @PhilipRucker: Thousands of Coloradans are screaming Mitt's name at Red Rocks. Like at a Bieber concert. Hope reporters remind their audience Romney/Ryan's Red Rocks event is occurring in a facility built by the gov't via FDR's socialist CCC. Do you think conservatives let that weak talking point slip by unchallenged? Of course not. @GarrettNBCNews Do they also point out the irony of Romney using a highway which was built with public funds. Or how about the airport. @GarrettNBCNews ummm… So are all the streets and town squares where Romney has had rallies. Feel that, libs? It’s momentum — and your guy doesn’t have it. Just ask Sandra Fluke.